The Cincinnati Fusion Ensemble is a professional performing ensemble with a threefold mission: to offer world-class performances, to foster young musicians through high-level music education, and to engage the community. CFE was established in 2013 and is comprised of a roster of over 30 nationally and internationally renowned singers based in the Cincinnati, Ohio area. The professional Ensemble, in various groupings, performs in the genres of choral music, art song, vocal chamber music, musical theater, jazz, folk music, oratorio, and chamber opera. Having produced a wide variety of concerts, the Ensemble continues to develop a unique mentorship program to offer applied lessons to highly talented students—regardless of their socio-economic status. These lessons are subsidized through grants and partnerships in the form of need and talent based scholarships. Students experience high-level, excellent instruction with teachers of the caliber found in the finest collegiate music schools. Integral to the advancement of CFE's mission, the Cincinnati Fusion Ensemble was approved in 2014 for state and federal non-profit status, and is a registered 501(c)(3) organization. 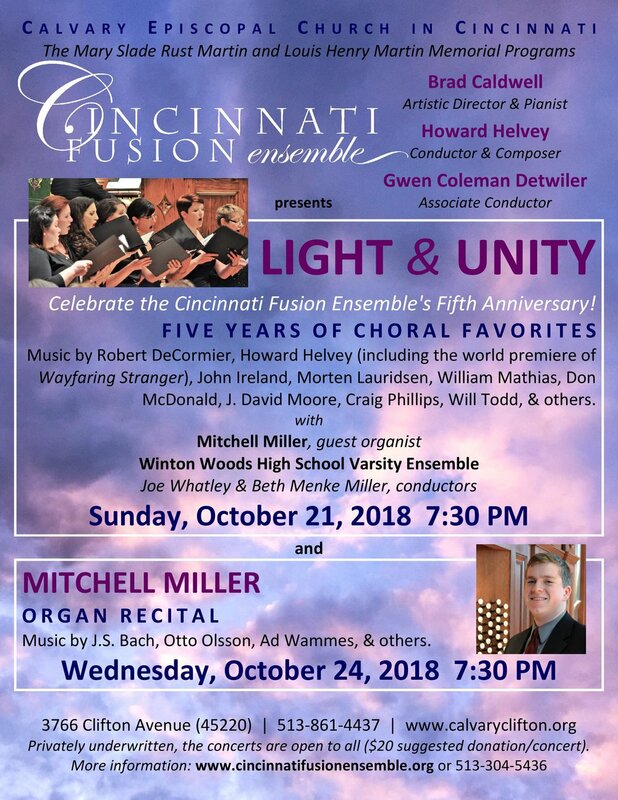 The Cincinnati Fusion Ensemble also sponsors an annual Choral and Voice Institute, an annual Voice scholarship competition, and various community enhancement projects including Winton Woods High School. On behalf of all of the CFE Artists, welcome! 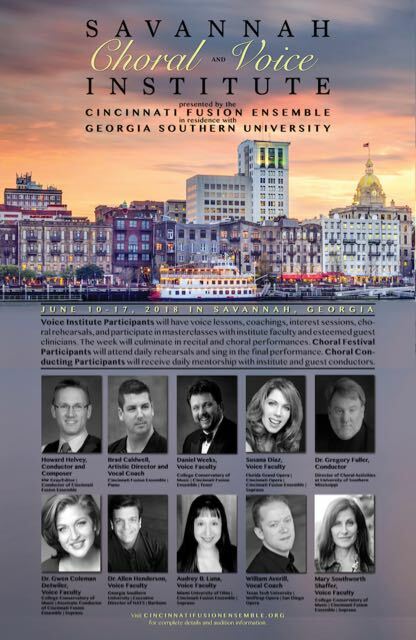 Thank you for your interest in the 2019 Savannah Choral and Voice Institute (June 9-16)! Click here for more details. Please join us for this fun annual fundraiser! Many of you have attended this Cincinnati Fusion Ensemble fundraiser in the past, and we are grateful! An RSVP (bectn@aol.com or text/voicemail to 513-304-4536) is helpful, but not necessary. We hope you'll join us for this fun evening on Friday, February 9, at 8 PM! Thank you for your interest in the 2018 Savannah Choral and Voice Institute! June 10 - 17, 2018 in Savannah, Georgia. 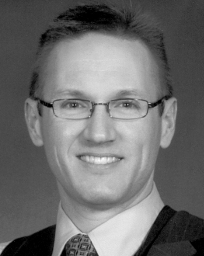 Read about Raymond Nagem and Mack Wilberg. These two professional chamber choirs will celebrate their inaugural collaboration with a program of music highlighting a broad stylistic palette, including a world premiere. Music by Bach, Bernstein, Distler, Gesualdo, Gjeilo, Finzi, Helvey, Ireland, Mulholland, Sowerby, and Warland. Three evening performances, featuring members and guests of the the Cincinnati Fusion Ensemble in the Gaslight Chamber Music Series, presented by Calvary Episcopal Church, in memory of Gerre Hancock & George E. Ferguson. Diane Meredith Belcher collaborates with members and guests of the the Cincinnati Fusion Ensemble in the Liturgy & Music Series, presented by Calvary Episcopal Church. 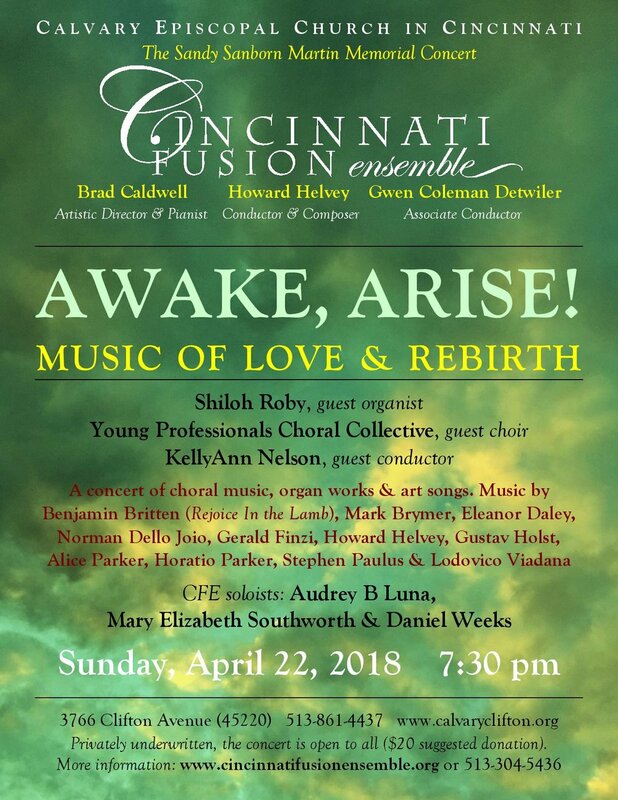 The Cincinnati Fusion Ensemble collaborates with celebrated guest conductor and organist Stephen Cleobury, Director of Music, Choir of King's College, Cambridge, England. The Cincinnati Fusion Ensemble is comprised of 16-24 nationally and internationally renowned singers based in the Cincinnati, Ohio area. The professional Ensemble, in various groupings, performs in the genres of choral music, art song, vocal chamber music, musical theatre, jazz, folk music, oratorio, and chamber opera.